Some kids like Minecraft so much that they're willing to get graded on how well they play the game. Elena Rezac, a 13-year-old at William Annin Middle School in New Jersey, even prefers playing at school to playing at home. "You have to do your best," the seventh grader told CNNMoney. "It ends up being way better than what you do at home." That's because there isn't really a "point" to Minecraft. The video game lets players build virtual worlds out of blocks, and sometimes there are zombie or animal attacks. But at school, students can use Minecraft to create their own games and story lines. Rezac has spent the past few weeks building a quest-driven maze inspired by "The Fifth Wave," a science fiction movie about earth after an alien attack. The main character of her game is Ella, one of 10 human survivors trying to protect the earth's plants from being destroyed by aliens. Rezac really wanted to take game design and development as an elective because it would allow her to work on multiple things at a time. She said, for example, that in art, she would only be able to paint a picture. But computer science is "a lot more fun because you can do whatever you want." Her teacher Steve Isaacs agrees and says he likes Minecraft because it allows students to be inventive. His class was one of the beta testers for Microsoft's new program Minecraft: Education Edition. "They can find an area where they can succeed," said Isaacs, a 24-year teaching veteran. "That's why I give so much choice." Students who take his elective have to write a design document that outlines the objectives and rules of their MInecraft game. Then they spend several weeks creating the game and get points for what they build. An A+ means 700 points. Rezac says she doesn't think too much about how to get a good grade. Competition among classmates doesn't really exist either because everyone builds their own version. "It's more fun [this way]," she said. Elena Rezac, of William Annin Middle School, has been beta testing Microsoft's Minecraft: Education Edition. Microsoft (MSFT) is pinning a lot of hope on Minecraft as a way to break into the education sector. 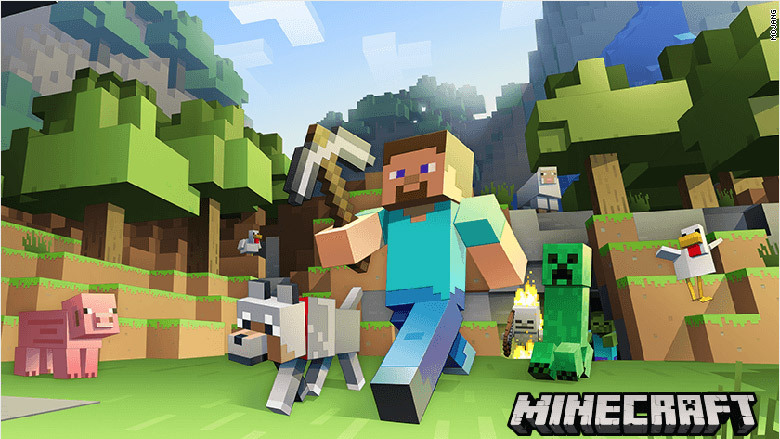 The game's massive popularity with kids (and adults) is one of the major reasons that the software giant bought Mojang, Minecraft's developer, for $2.5 billion two years ago. On Thursday, Microsoft announced that schools and teachers can download a special education version of the game for free. The company also added several new features to the game that make it easier for teachers to give feedback, as well as classroom collaboration tools and a simpler setup process. A full version of Microsoft: Education Edition will go on sale in September and costs school districts an average of $1 to $5 per player each year. About 1,700 students participated in the beta program. Rezac has been playing Minecraft since she was eight. CNNMoney met her and Isaacs at a recent Microsoft event promoting the game. Three eighth grade boys we talked to said they have been playing for about five years as well. 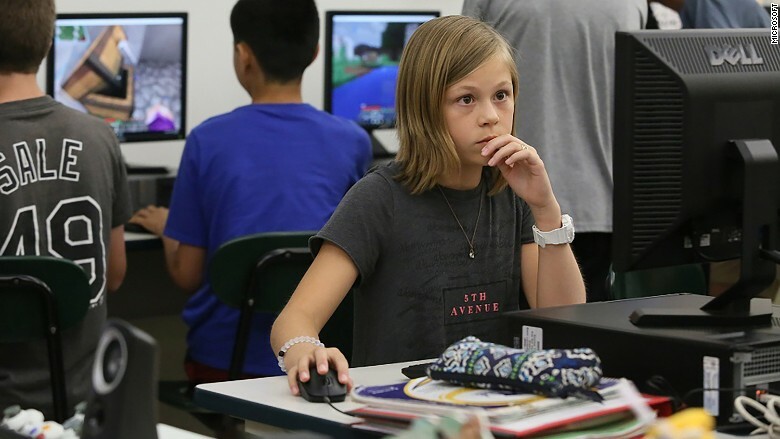 Tom Ruggiero, a 14-year-old in Isaacs' class, said he likes Minecraft because it involves more variables and therefore more freedom to create. His classmate Ethan Otash, also 14, agreed and said the game teaches skills such as engineering. After learning the basics, students can make the game more complex. Because Minecraft is so customizable, Isaacs said aging out of the game isn't likely. "There's a sweet spot," he said. "But that sweet spot is huge."